The rush of a busy schedule, a barrage of disheartening news stories, and the wear and tear of everyday life can be enough to drag anyone down. Simply pausing to recognize and express thanks for the good gifts that surround you has proven to make a major difference in happiness, peace, and contentment. 100 Days of Thanks, a beautifully designed inspirational book of short readings, Scripture verses, and journaling space is the perfect tool to promote Christian mindfulness and gratitude. Whether you are looking for a thoughtful gift to encourage a loved one or a simple tool to create a habit of thankfulness, this lovely little book is a wonderful place to start. Take a few moments out of your day to be grateful and feel your burdens get a little lighter, starting today. 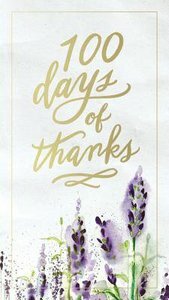 About "100 Days of Thanks"